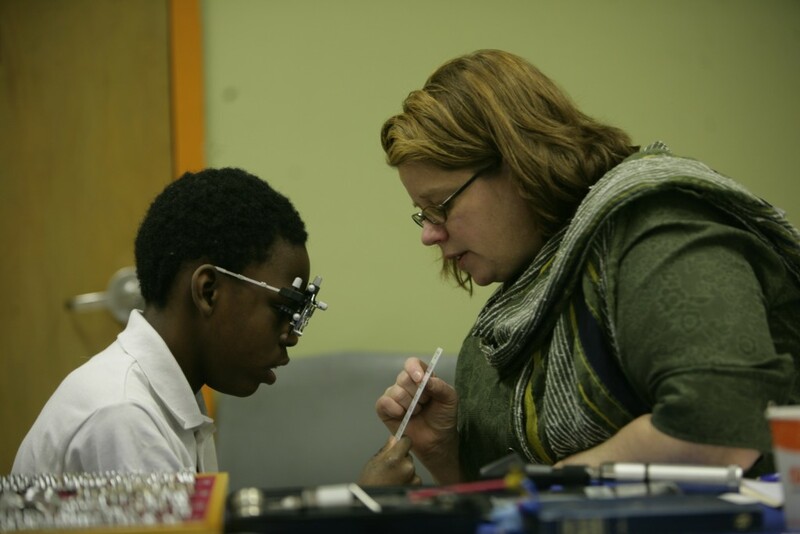 The Seeing Is Believing Program provides no-cost low vision exams and corrective devices to students with visual impairments attending public schools in Metropolitan Chicago. The program aims to help students increase confidence and improve academic performance by addressing educational barriers resulting from vision loss. With the continued support of The Lions of Illinois Foundation, the Seeing Is Believing program has benefited hundreds of children since it launched in 1991. Rehabilitation services provided by the Seeing Is Believing Program are free of charge to students and their families. Students are referred by a vision coordinator in their school district who organizes a screening day and arranges student appointments with a visiting low vision optometrist from The Chicago Lighthouse. Lighthouse optometrists travel to the screening location, bringing equipment for examinations and demonstrations of low vision devices, such as magnifiers and telescopes. Following the appointment, all prescribed lenses and devices are sent to the vision coordinator, who distributes to students and provides instructions for use. In addition, Lighthouse optometrists make personalized recommendations for each child, referring patients to orientation and mobility training, vocational counseling, Braille instruction and adaptive technology resources, as necessary.